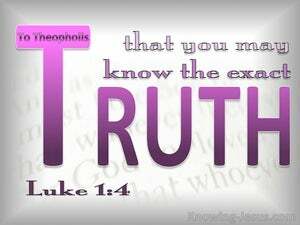 ﻿ Luke 1:4 that you may fully know the truth of the things which you have been taught by word of mouth. so that thou might know the certainty of the declarations about which thou were instructed. Then you could know how reliable the information is that you have been told. that you might know the certainty of the things in which you have been instructed. so that you may know the certainty of the things which you have been taught. that you may have a distinct view of those things about which you have been inform'd. in order that thou mayest know the certainty of the words concerning which thou hast been instructed. so that you may be reliably informed about the things you have been taught. That thou mayst know the certainty of those things, wherein thou hast been instructed. That thou mightest know the certainty of the words concerning which thou hast been instructed. so that you may know the certainty concerning the things about which you were taught. so that you might know the certainty of those things in which you have been instructed. that thou mightest know the certainty of those things, whereof thou art informed. to let you know the solid truth of what you have been taught. so that you may know the certainty of the story which you have been taught by the word of mouth. 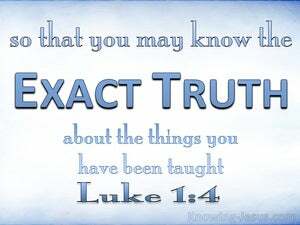 that thou mightst know the exact truth with regard to those things in which thou wast instructed. that you may know the certainty of the words concerning which you have been taught. that, as touching the matters which thou hadst been taught by word of mouth, thou mightest obtain full knowledge, of the certainty. to the intent that thou mayest clearly know the certainty of those matters, concerning which thou hast been instructed. that you may better know the certainty of those things that you have been taught. that you may fully know the certainty of the words wherein you were instructed. most excellent Theophilus, that thou mayst know the certainty of the things wherein thou hast been instructed. 3 it has seemed right to me also, after careful investigation of the facts from their commencement, to write for you, most noble Theophilus, a connected account, 4 that you may fully know the truth of the things which you have been taught by word of mouth. 5 There was in the time of Herod, the king of Judaea, a priest of the name of Zechariah, belonging to the class of Abijah. He had a wife who was a descendant of Aaron, and her name was Elizabeth. But let those who receive instruction in Christian truth share with their instructors all temporal blessings.